British Forces Drawdown and the Refugee Crisis – an Economic Opportunity for Germany? British parade at Bielefeld, Germany. 02.05.2013. 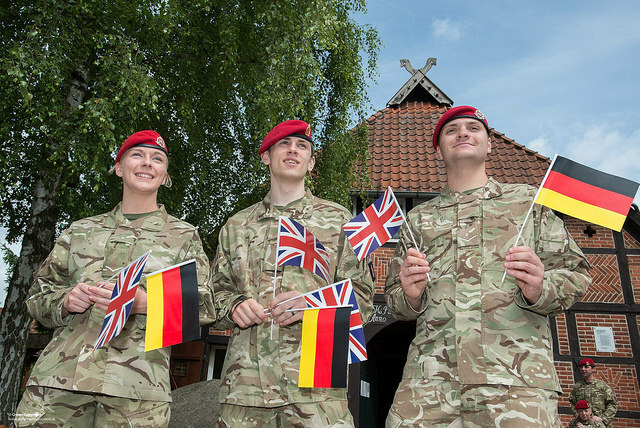 A fresh look at the consequences of the British Forces drawdown in Germany, which is to be completed by 2020 and will leave several German towns and areas struggling economically as they attempt to fill the void left by thousands of British servicemen returning home to the UK. The current refugee crisis may perhaps represent a new opportunity for German communities facing economic hardship, since the barracks facilities must be re-purposed if they are not to decay. The author has first hand experience of two difficult processes currently faced by the UK and Germany. by Nicolas Walton. Germany’s recent history has had consequences that are not always visible at first glance. Not everyone in Germany or abroad is aware of the extent to which foreign forces stationed troops in Germany following the end of WW2. Nor is it common knowledge that this situation has continued right up until the present day, despite the end of the Cold War and German Reunification recently having celebrated their 25th anniversary. And it was not only the victorious powers of WW2 which stationed troops in Germany. Apart from American, British and French forces, Belgium and the Netherlands, for example, also maintained garrisons in Germany. But of interest here is not the military occupation of a defeated power’s homeland; rather, it is that the subsequent growth of the relationship between the British troops and the German populace quickly became one of mutually beneficial cooperation and, for a number of German towns and areas such as, for example, Bielefeld, Bad Fallingbostel, Gütersloh, Hohne and elsewhere, economically indispensable. The British commitment was until 1994 known as the British Army of the Rhine, but was then relabelled British Forces Germany, or simply BFG. While some of the British troops have already returned to the UK and their bases closed, other bases are still in the process of being shuttered. The drawdown process is complex and complicated, with facilities having to be dismantled, surplus equipment shipped back to the UK or returned to the German government, and settlement sums negotiated. A Drawdown Programme Manager based in Germany estimated that, in total, the British Forces must “return four garrisons, 26 barracks, and 17,500 hectares of training estate to the German authorities before 2020”, an immense task. The extent of the problem is hardly surprising considering that there were tens of thousands of troops stationed in Germany. Members of the Royal Military Police in Bergen, Germany. 18.06.2014. Although German military bases have also been closed, this is not quite the same since, for example, this did not represent an international and intercultural relationship. In essence, there are two issues of interest here: not all of the facilities being handed over to Germany will be successfully converted to suit a new purpose, nor are all personnel who were formerly employed by BFG returning to the UK. Many are UK citizens who came out to Germany decades ago, found a new home in Germany and wish to stay. Others are German citizens who have spent years working for BFG. Although BFG has worked hard to make adequate settlement packages available to both UK and locally employed German personnel, this does not change the fact that many people now have to find new jobs. And many of these people have never done anything else but work for the British Forces in a certain and very specific capacity, making re-training a challenging prospect. A challenging situation for both the UK and Germany – but also an opportunity? Therefore the challenges are indeed huge for all concerned: for the British Forces rebasing thousands of troops, for the employees being let go and forced to seek new work, and for the local urban and rural communities of which some now face economic hardship. And despite the British government co-operating closely with the German authorities in solving the question about future use of the facilities, there does not seem to be an easy solution readily available. After all, what does one do with huge housing complexes in quiet urban and rural areas? One thing seems certain: the German towns and areas which for such a long time have depended on the foreign troops as a customer base will now struggle. But in terms of outlook, a new opportunity may now have arrived in the form of the many refugees fleeing to Germany from their war-torn homelands in Syria, Afghanistan or Iraq. First and foremost these refugees require shelter, particularly in the difficult wintery conditions currently affecting Germany. Debates have already arisen about the potential need to commandeer infrastructure to house refugees, and here the often first-rate facilities formerly provided for British troops may come in handy, particularly if these facilities are standing empty anyway. It would be a waste if these barracks facilities were not re-purposed and were instead permitted to decay. In addition, after having been granted time to learn about Germany and its customs and acquire at least a rudimentary understanding of the German language, these refugees will also be seeking work. And opportunities to spend and enjoy their hard-earned salaries, turning them into the new customer base which the now economically struggling former garrison towns and areas are in need of. 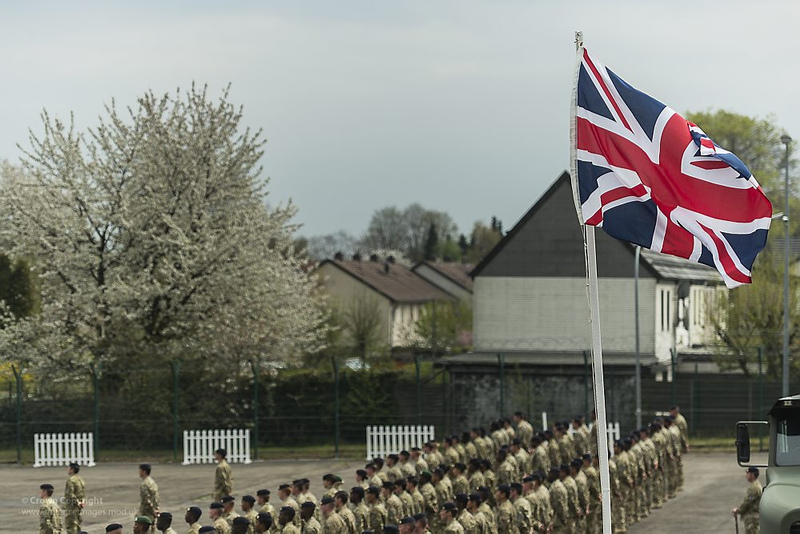 Bild 1: „Union Flag Flying Over Soldiers on Parade“, 7 Regiment, Royal Logistics Corps at Bielefeld, Germany, 02.05.2013. Urheberrechte (Bild + Titel) liegen bei Mark Nesbit & Defence Images. © Crown Copyright 2013 Photographer: SSgt Mark Nesbit RLC. Lizenz: Creative Commons Attribution-ShareAlike 2.0 Generic (CC BY-SA 2.0). Bild 2: „Royal Military Police in Bergen, Germany“, 111 Provost company RMP in Bergen, Germany, 18.06.2014. Urheberrechte (Bild + Titel) liegen bei Mark Nesbit & Defence Images © Crown Copyright 2014 Photographer: SSgt Mark Nesbit RLC (Phot). Lizenz: Creative Commons Attribution-NonCommercial-NoDerivs 2.0 Generic (CC BY-NC 2.0).